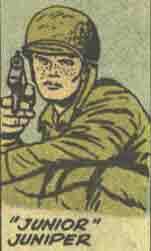 Powers/Abilities: "Junior" Juniper was a trained ranger/commando, and also had experience as a tailgunner on a B-17. He wielded a rifle and grenades while in the field. History: (Sgt. Fury and his Howling Commandos#34 (fb)) - Jonathan Juniper was a young Ivy League College student who joined the American armed forces after World War II broke out. By the time he was assigned to Captain Sam Sawyer's First Attack Squad, "Junior" had already shot down ten German planes while serving as a tailgunner on a B-17. (Sgt. Fury and his Howling Commandos#44 (fb)) - By the fall of 1942, the First Attack Squad had undergone 6 weeks of training under Sawyer, and were finally granted their field assignment: to rescue Dr. MacMillan, an English rocket scientist, from a German base outside of Paris. The Squad traveled through the snow to the German complex and took out the perimeter guard, but soon realized that they did not possess enough firepower to take on the entire complex. The Germans even taunted them, sending out a sound truck to broadcast demands for their surrender. As the Squad waited in the snow, Junior took out his Bible to read, and read about how Gideon's army of 300 bested 100,000 Midianites by overcoming them with noise. He suggested to Fury that they do something similiar by stealing the sound truck. With the sound equipment in their custody, the Squad amplified the noise of their own shouting and weapon fire so that the Germans would think there were more of them. The Germans began to panic, and the Squad raided the complex, just as some of the soldiers began to evacuate. They managed to rescue Dr. MacMillan, then drove out of the Germans' lines in one of their own trucks. They returned MacMillan to England, and were given a less than glowing response from Captain Sawyer, but Winston Churchill himself phoned Sawyer and gave the Squad his blessing, granting them the honor of becoming the first Ranger Squadron to also bear the rank of Commandos in His Majesty's Army. Sawyer decided he would call them "the Howling Commandos" because of the "rebel yell" they had used to trick the Germans. (Sgt. Fury and his Howling Commandos#1) - Junior joined the Howlers in a mission to France, to rescue Pierre LaBrave, a member of the French underground who possessed knowledge of the Allies' D-Day plans, but had fallen into the hands of the Nazis. Junior and the other Howlers were aided by members of the underground, including Pierre's daughter Marie, and were able to rescue Pierre and take his captor, General Von Ritznik as their captive. (Sgt. Fury and his Howling Commandos#2) - The Howlers invaded a French coast town and created a diversion by engaging the Germans there while the Allied navy destroyed the German U-Boat pens there. The Howlers managed to escape the Germans and returned to England, only to be immediately reassigned by Sawyer on a mission to Heinemund to destroy an atomic energy research facility. The Howlers disguised themselves as German seamen to sneak into Germany, but they were quickly discovered, and Dum-Dum was captured. The Howlers came to Dum-Dum's rescue, breaking him out of Gestapo Headquarters. As they were still miles from Heinemund, Junior came up with a way to get there faster-- they surrendered to a German and begged that they not be sent to Heinemund (the old "briar patch" trick!). The German fell for it and sent them to the Heinemund concentration camp. The Howlers easily armed themselves within the camp by taking weapons from the guards, and broke out, then set off for the facility. The Howlers ruined the safety rods in the atomic pile, and it ultimately destroyed the entire facility. The Howlers met up with a submarine, and it brought them back to England. (Sgt. Fury and his Howling Commandos#3) - After returning from a successful mission to capture Germans, the Howlers went out for drinks at the King's Whistle, but some of the other patrons made fun of them. The Howlers put up such an intense fight that the military police needed a tank to bring the Howlers in, and over a dozen men were hospitalized! The officer in charge of the guard house begged Sawyer to send them on a mission. Sure enough, Sawyer had another mission for the Howlers-- to the coast of Italy, to meet with Major Richards of the O.S.S. Richards informed the Howlers that an American division was bottled up behind Massacre Mountain and needed an escape route, which the Howlers were to provide. The Howlers met up with the division, but couldn't find an escape route because booby traps lay everywhere. They finally learned that Hans Schmidt, a Waffen S.S. officer had impersonated a journalist and was sending information to his fellow officers, but Dino Manelli and Juniper got the drop on him, and Manelli killed him. The Howlers finally helped lead the division through the German lines, and returned to England. (Sgt. Fury and his Howling Commandos#4) - The Howlers were sent on a mission into Berlin to capture Lord Ha-Ha, a Englishman who was providing propoganda services to the Nazis, and disguised themselves as circus performers in order to reach him. The Howlers brought him to a house on the coast of Bremerhaven while they waited for their transport back to England, but when a Nazi patrol went by, Lord Ha-Ha blew their cover, even though he was killed himself. The Howlers stormed into battle, but Juniper was hit and died in Dino Manelli's arms, telling him to keep on fighting with his last breath. Juniper's body was sent to England when the Howlers' transport finally arrived. Junior's place on the Howlers' roster was taken by Percival "Pinky" Pinkerton. Junior was the first of the Howlers to die, and the only recurring Howler to die, period (Eric Koenig, Dugan, and Fury have each been thought dead, but it never lasted). Junior was killed off because he had the least potential as a character in the series, but his worth to the Howlers as the one who died has been tremendous. Junior is a character whose death has haunted Fury all the way up to modern day stories. The death of Junior also heralded a change in tone for the entire Sgt. Fury title, which had been an unrealistic and goofy war comic up until then. The final panel of Sgt. Fury#1 flashed-forward, depicting the seven Howling Commandos on D-Day. Of course, Junior didn't live to see D-Day! 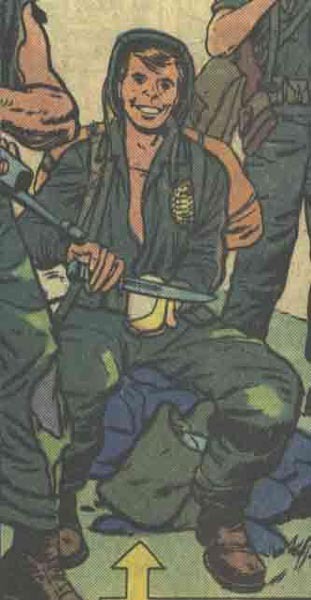 Since Junior isn't really recognizeable in the panel, this should probably be thought of as an appearance by Percival Pinkerton, who was present on D-Day with the Howlers (Sgt. Fury Annual#2). Major Richards of the O.S.S. was supposed to be Reed Richards, but Marvel's sliding timescale makes this seem less and less likely (not that the Howlers themselves have been aging appropriately either). Unless it turns out that Reed time-traveled back to World War II, this should be considered an appearance of Jonathan Richards, Reed's grandfather. Junior Juniper has an entry in Marvel Legacy: The 1960s Handbook.